Quantum computers are a fundamentally different sort of computer that take advantage of aspects of quantum physics to solve certain sorts of problems dramatically faster than conventional computers can. While they will, no doubt, be of huge benefit in some areas of study, some of the problems that they are effective at solving are the ones that we use to secure digital communications. Specifically, if large quantum computers can be built then they may be able to break the asymmetric cryptographic primitives that are currently used in TLS, the security protocol behind HTTPS. However, a hypothetical, future quantum computer would be able to retrospectively decrypt any internet communication that was recorded today, and many types of information need to remain confidential for decades. Thus even the possibility of a future quantum computer is something that we should be thinking about today. The study of cryptographic primitives that remain secure even against quantum computers is called “post-quantum cryptography”. Today we're announcing an experiment in Chrome where a small fraction of connections between desktop Chrome and Google's servers will use a post-quantum key-exchange algorithm in addition to the elliptic-curve key-exchange algorithm that would typically be used. By adding a post-quantum algorithm on top of the existing one, we are able to experiment without affecting user security. The post-quantum algorithm might turn out to be breakable even with today's computers, in which case the elliptic-curve algorithm will still provide the best security that today’s technology can offer. Alternatively, if the post-quantum algorithm turns out to be secure then it'll protect the connection even against a future, quantum computer. Our aims with this experiment are to highlight an area of research that Google believes to be important and to gain real-world experience with the larger data structures that post-quantum algorithms will likely require. We're indebted to Erdem Alkim, Léo Ducas, Thomas Pöppelmann and Peter Schwabe, the researchers who developed “New Hope”, the post-quantum algorithm that we selected for this experiment. Their scheme looked to be the most promising post-quantum key-exchange when we investigated in December 2015. Their work builds upon earlier work by Bos, Costello, Naehrig and Stebila, and also on work by Lyubashevsky, Peikert and Regev. We explicitly do not wish to make our selected post-quantum algorithm a de-facto standard. To this end we plan to discontinue this experiment within two years, hopefully by replacing it with something better. Since we selected New Hope, we've noted two promising papers in this space, which are welcome. Additionally, Google researchers, in collaboration with researchers from NXP, Microsoft, Centrum Wiskunde & Informatica and McMaster University, have just published another paper in this area. Practical research papers, such as these, are critical if cryptography is to have real-world impact. 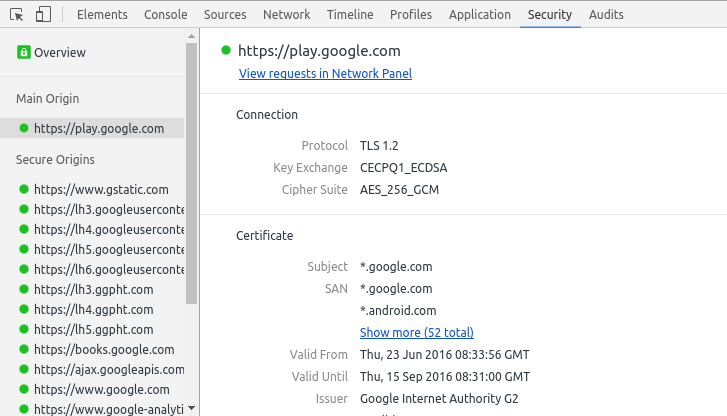 This experiment is currently enabled in Chrome Canary and you can tell whether it's being used by opening the recently introduced Security Panel and looking for “CECPQ1”, for example on https://play.google.com/store. Not all Google domains will have it enabled and the experiment may appear and disappear a few times if any issues are found. While it's still very early days for quantum computers, we're excited to begin preparing for them, and to help ensure our users' data will remain secure long into the future.